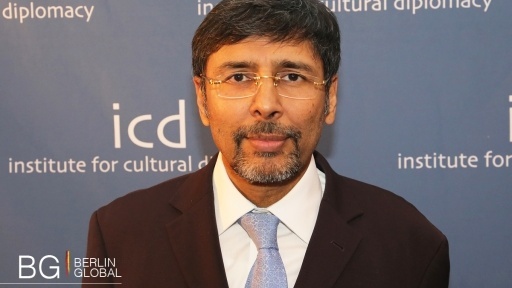 Jauhar Saleem is a Pakistani career diplomat. He has served as Pakistan's Ambassador to Germany since January 2016. He holds a Master’s Degree in English (Literature), a Master’s in Government Administration from the University of Pennsylvania in the USA, a Master’s in International Economics and Public Policy from John Hopkins University in the USA, and finally a Fellowship at George Town University, USA. In 1985, Amb. Jauhar Saleem joined the Foreign Service of Pakistan. He served at the Headquarters as Desk Officer, Director, Deputy Chief of Protocol from 1986 to 1999, he was Director General (2006-2008) and Additional Secretary/Head of Foreign Service Academy (2014-2016). He held diplomatic assignments in Pakistan Missions abroad: Brasilia (1989-1993), Ankara (1999-2002), and served as Ambassador to Bosnia & Herzegovina (2008-2011) and Ambassador to Bahrain (2011-2014). Germany is keen to see stable and democratic development in Pakistan and for Germany to play a constructive role in the region. To mitigate the effects of the flood disaster in Pakistan in late summer 2014, the Federal Government has made available a total of more than EUR 6 million, bringing the total volume of federal budget funding for humanitarian aid projects in Pakistan to nearly EUR 12 million. The relief measures are implemented by German non-governmental organisations and international organisations such as the United Nations Refugee Agency and the World Food Programme. In the 2014 calendar year, Germany’s bilateral trade with Pakistan stood at EUR 2.07 billion. German exports to Pakistan were worth EUR 806.2 million and German imports from Pakistan EUR 1.27 billion. Pakistan’s principal exports to Germany are textiles, leather goods, medical instruments, Basmati rice and jewellery. Pakistan’s main imports from Germany are chemical products, machinery, electrical goods, motor vehicles and iron goods. With its Technical and Financial Cooperation measures, Germany is supporting the Pakistani government’s key reform projects, such as the Fiscal Pact and the National Energy Policy, as well as the implementation of Pakistan’s obligations to the International Monetary Fund (IMF). In addition, Germany provides assistance to both Afghan refugees in Pakistan and internally displaced Pakistanis who were forced to leave their homes temporarily as a result of the Pakistani army’s military offensives against the insurgency. The geographical focus of German development cooperation with Pakistan is in the north and west of the country (Khyber Pakhtunkhwa Province and the Federally Administered Tribal Areas, FATA), with individual measures also being implemented in Baluchistan, Punjab, Gilgit Baltistan and AJK (Azad Jammu and Kashmir). Pakistan is one of the first of Germany’s partner countries to benefit from innovative development funding instruments. Well-established and effective academic and scientific exchange has for many years featured prominently in cultural relations between Germany and Pakistan.